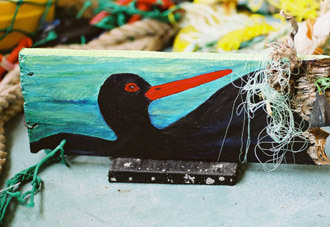 TOBY (African Black Oystercatcher) A bird with this line, hook and sinker around its wing was released by a friend. 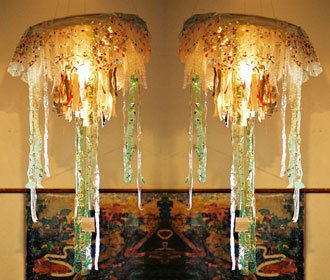 Jellyfish Light Bicycle rim, glass shade, plastic, snack wrappers. 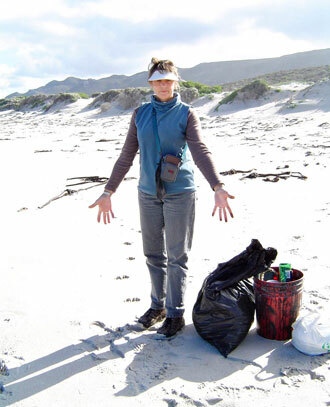 "The power of one to care can change everything here"
How can we deal with the rest of this human-generated trash? Make Something Out Of Nothing!! The SEALIFE CD and LEARNERS� GUIDE with accompanying ACTIVITY SHEET shows you how to use materials creatively and effectively to make saleable items. Only paint, varnish and glue were purchased. This CD of slides is suitable for schools, fishing clubs, craft centres, artists and environmental groups. The manufacturers of plastic and nylon equipment as well as the food packaging industry could also be made aware of the problems relating to their products. How do I a get a copy of the Sealife Hope CD?